Bowtie Delivery to Corporate Clients | Learn how to start and operate your own Corporate Concierge Business at Concierge101.com. The fresh curated meal concierge service for foodies with jobs, Foodee, today announced the formal launch of its high-end corporate food delivery service in the Minneapolis market. 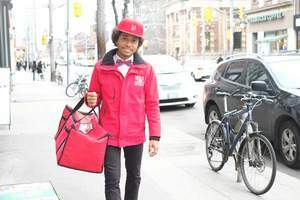 The company, which focuses on delivering the city’s finest local food to downtown office workers, has already partnered with some of the city’s leading chefs and restaurants, and expects to offer fare from nearly 50 top providers in the coming months. Fresh on the heels of its recent $6 million Series A funding round, Vancouver-based Foodee comes to Minneapolis differentiated from residential food delivery options by exclusively serving corporate clientele and partnering with unique and highly popular restaurants that typically don’t deliver. The company’s commitment to corporate clients and a seamless customer experience gives Foodee a compelling value proposition, including local account management, live concierge service, bespoke menu selections, professional waiter/delivery services, and elegant cloud-based ordering platform to ensure order accuracy and on-time delivery. Foodee is also unique in its obsession with eco-friendly business practices, including a commitment to 99 percent recyclable or compostable packaging and sustainable delivery fleets wherever possible. Current Minneapolis restaurants partners include Agra Culture, Amazing Thailand, Bagu Sushi & Thai, Birchwood Cafe, Bizzy Coffee, Domo Gastro, Hello Pizza, Hot Indian Food, Izzy’s Ice Cream, Patisserie 46, Pizzeria Lola, Prairie Dogs, Rustica Bakery, SotaRol, Sprout Salad, Sssdude-Nutz, The Copper Hen and TRUCE, offering a fresh and unique array of menu options for breakfast, lunch and afternoon snacks. Companies based in Foodee’s downtown Minneapolis delivery zone are invited to sign up for a complementary meal for up to four coworkers by registering at https://eat.food.ee/welcome-minneapolis/. This entry was posted in business, corporate concierge services, entrepreneur, home business, income, lifestyle, marketing, personal concierge service, SEO, small biz, small business, startup, Uncategorized, work from home. Bookmark the permalink. Brilliant Idea! There are many hungry people out there, and they’re too busy to leave their offices!